To kick off the year, Exploring London is taking a look at 10 of the more unusual memorials in London. 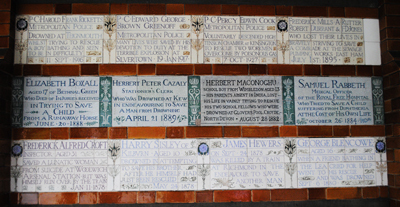 First up is the Watts Memorial in Postman’s Park. Located between St Martin’s le Grand and King Edward Street, just off London Wall next to St Botolph-without-Aldersgate, the park is actually located in what was the former churchyard of St Botolph, Aldersgate, St Leonards, Foster Lane, and the graveyard of Christchurch, Newgate Street. It was apparently named for the fact that the southern boundary once adjoined the General Post Office and its popularity with postal workers. The G.F. Watts Memorial To Heroic Self Sacrifice was first unveiled in 1900. It had been conceived by the Victorian artist George Frederic Watts initially to mark Queen Victoria’s Jubilee in 1887 but wasn’t constructed until some time later. The memorial features a series of ceramic ‘tablets’ embedded in the wall which record the names and deeds of those who died trying to save others. According to the memorial, “Watts believed that these ‘everyday heroes’ provided models of exemplary character and behaviour”. The memorial also quotes Watts as saying that “the material prosperity of a nation is not an abiding possession; the deeds of its people are”. Watts, a prominent artist of the Victorian period – so much so that he was apparently once dubbed ‘Britain’s Michelangelo’, put up 13 tablets but after his death in 1904 his wife Mary added a further 34 after his death. The plaques celebrate those who gave their own lives in rescuing people from house and factory fires, runaway trains, sinking ships and drowning. Not all were successful and while some of the plaques recall the heroic feats of police or firemen, others who died making the ultimate sacrifice were factory workers, ballet dancers, children or in the case of Alice Ayers, the daughter of a bricklayer’s labourer, who saved three children from a house fire (her story is featured in the recent film Closer). Most of the tablets date from the late 1800s and early 1900s and until recently the most recently dated from 1931. In 2009, however, a new memorial was added – that of Leigh Pitt, a 30-year-old reprographic operator, who died on 7th June, 2007 after saving a boy from drowning in a canal at Thamesmead in the city’s south-east. A moving tribute to those who gave all they had to save the life of others. WHERE: Postmans Park, between King Edward Street and St Martin’s le Grand (nearest tube station is St Paul’s or Barbican); WHEN: The park, managed by the Corporation of London, is open 7am to 8pm or dusk (whichever is earlier) ; COST: Entry is free; WEBSITE: The Watts Gallery in Surrey has some information about the park on its website, www.wattsgallery.org.uk/exhib_postmanspark.html. Let me know if you know of a curious memorial you think should be mentioned. Just leave your comment below or send an email to exploringlondon@gmail.com.